We woke up to a glorious day after a nice, cool night (24 degrees). A relaxed day on the beach, trying to send some emails, meet some fellow travelers who have just arrived from Europe. Some are traveling to Egypt and others are traveling to Australia via India. 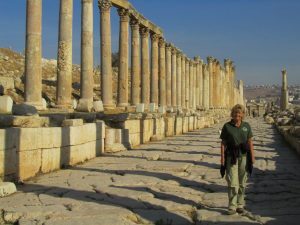 We were surprised to see so many travelers and tourists in Jordan, but little did we know what was ahead. Back in civilization, lots of European holiday makers, lots of people travelling by car from Europe. In fact, this is the first time we have met so many Europeans in cars and trucks. The weather is perfect, and the extreme heat has now gone. Our camp ground even has a swimming pool. However, it also means high prices again and a difference between local and tourists. Even the fuel is expensive again. Well, I suppose not for Europeans who are used to paying Euro 1.50 per liter. But for us from 7 cents per liter in Saudi Arabia to $1.00 dollar in Jordan (E 0.60) this is expensive. 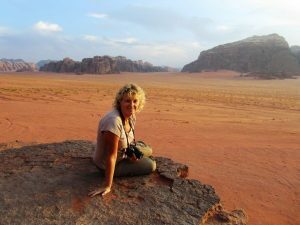 Jordan is very popular with Europeans who love beaches and warm weather. Diving the Red Sea is also a must. This, combined with lots of historic sites, make it a perfect destination. To top it off, because Jordan is a small country, getting around is easy and fast on superb roads. Aquaba`s asset is the Red Sea itself. Here you can experience some of the best snorkeling and diving in the world. The temperate climate and gentle water currents have created a perfect environment for the growth of corals and a teeming plethora of marine life. Here you can swim with friendly sea turtles and dolphins as they dart amongst the schools of multi-coloured fish. Night dives reveal the nocturnal sea creatures, crabs, lobsters and shrimp, as they search for a midnight snack. No stingers, no crocodiles and no sharks. From as far back as five and half thousand years ago Aqaba has played an important role in the economy of the region. It was a prime junction for land and sea routes from Asia, Africa and Europe, a role it still plays today. Because of this vital function, there are many historic sites to be explored within the area, including what is believed to be the oldest purpose-built church in the world. Reluctantly we are leaving Aquaba after another week of R&R. 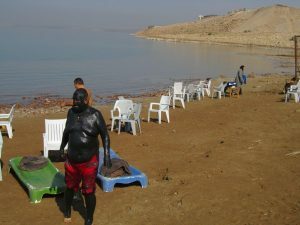 We had a swim in the warm waters of the Red Sea (Gulf of Aquaba to be exact) and we had a swim in the pool of Bedouin Village, the place where we camped. 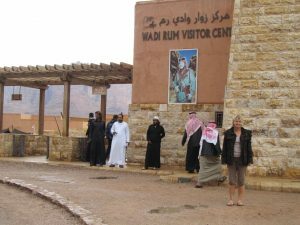 We’re off to the second tourist attraction in Jordan, Wadi Rum. 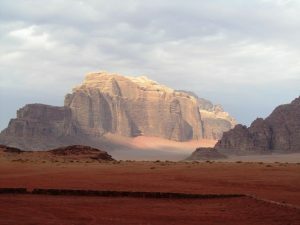 We are told that Wadi Rum attracts 2000 tourists a day. Dark clouds moved in over the mountains as we left Aquaba and it wasn’t long before we were hit with a huge thunderstorm with rain pelting down. Rain in the desert! 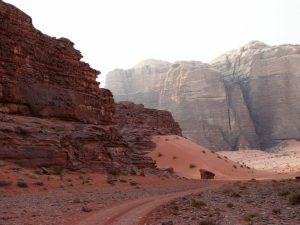 Wadi Rum is a stupendous, timeless place, virtually untouched by humanity and its destructive forces. A maze of monolithic rocks capes rises from the desert floor to heights of 1,750 meters creating a natural challenge for serious mountaineers. 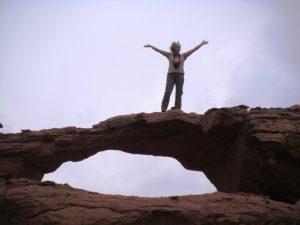 Hikers can enjoy the tranquillity of the boundless empty spaces; explore the canyons and water holes to discover 4000-year-old rock drawings and the many other spectacular treasures this vast wilderness holds in store for us. The first thing we noticed were the many tourist busses full of European tourists. We walked around the Visitor Centre, watched the movie about Wadi Rum and this convinced us we had to stay and wait for the rain to stop. The day before in Aquaba, we met a Dutch couple, Martijn and Maud, who are travelling to Australia by car (VW combi bus). 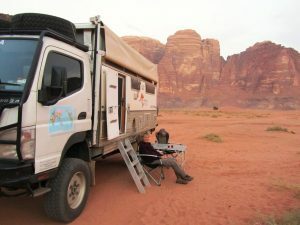 They came looking for us at the Visitor Centre and we decided to camp together tonight in the middle of the Wadi Rum desert. 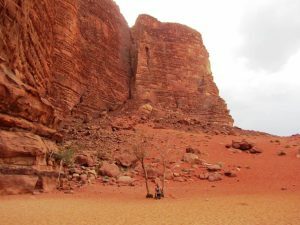 Described by Lawrence of Arabia as “vast and echoing” Wadi Rum did not disappoint. 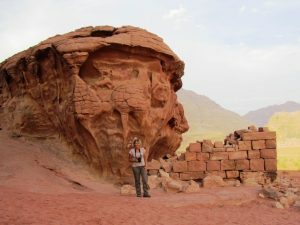 It has an outstanding desert landscape with sheer sided mountains of sandstone and granite which emerge from open valleys to reach heights of over 1700 meters, beautiful narrow canyons cut deep into the mountains. We also noticed lots of rock art. 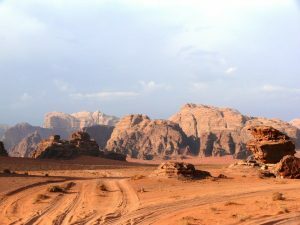 Wadi Rum is now a protected area and covers over 720 square km for everyone to explore and test 4 WD skills in soft sand. 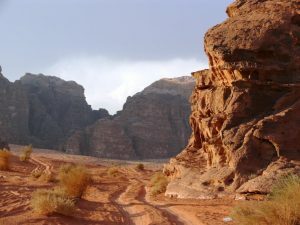 The whole area is home to several Bedouin tribes and their goat`s hair tents, which feature in the landscape. 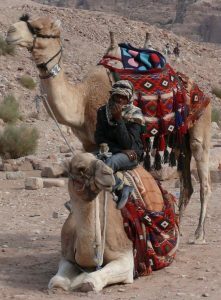 Today they mainly live off tourism, but they still retain goat herds and other traditional ways of life. 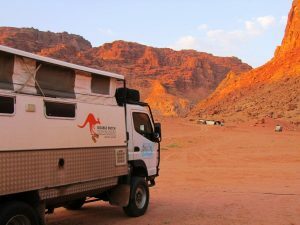 Wadi Rum also supports a surprising variety of wildlife with the Syrian wolf, striped hyena and Nubian ibex. 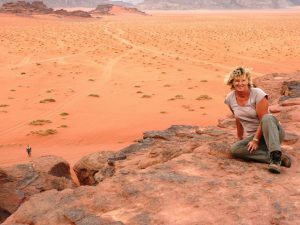 After we returned from exploring Wadi Rum, we had a cup of tea with the local Bedouin tribe and settled for the evening enjoying the mountainous desert and stars; not as many as we have been used to, but this was due to a shiny moon. After a perfect sunsets and perfect sunrises over the last 4 days it was time to move on to our next destination Petra, which is only 100km north of Wadi Rum. The whole 100km was on a perfect bitumen surface, two to three lanes wide and the highway climbs to 1700m above sea level. Arriving in Petra we were confronted with full carparks and over one hundred busses! We were told Petra gets on average 4,000 visitors per day, but on peak days there can be over 30,000. What a mixture of people from the very lightly clothed Northern Europeans to the Saudi Arabia woman wrapped like a birthday present with occasionally just a bare toe visible. Entrance fee for the two days was $154.00 AUD. and there was only a few dollars difference between one day or two days. Petra is unique in every aspect and words can hardly do justice to its true magnificence. It is a stunning place to visit and this remote dead city is one of the great archaeological treasures in the world. 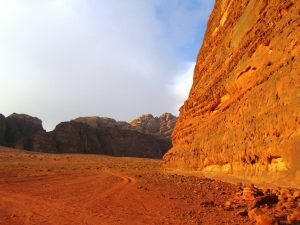 The area surrounding Petra has awesome, multi-coloured mountains. 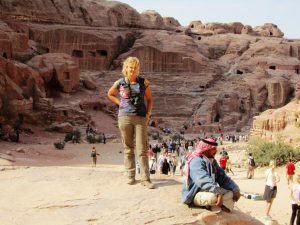 Petra is built on a secluded site of steep rocky slopes, and high cliffs into which most of the celebrated tombs, facades, theatres and stairways are carved. The whole ancient city is carved into solid rock by the Nabataeans, whose capital it became. Word of warning; if you arrive around 9am or 10am, you will arrive with about 100 busses so be prepared for a long queue. Europeans are used to this, but we are not. However, the site opens at 6am and at that time of the morning you have it yourself until about 9am. We must have walked over 10km today and despite being winter the temperature hovers around 33 degrees Celsius. 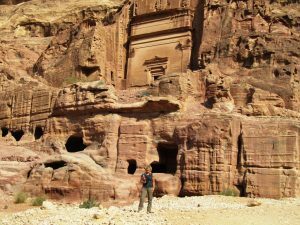 Although much has been written about Petra, nothing really prepares you for this amazing place. It has to be seen, to be believed. A Roman-style theatre, which could seat 3,000 people. 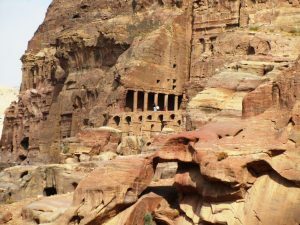 There are obelisks, temples, sacrificial altars and colonnaded streets, and high above, overlooking the valley, is the impressive Ad-Deir Monastery – a flight of 800 rock cut steps takes you there. 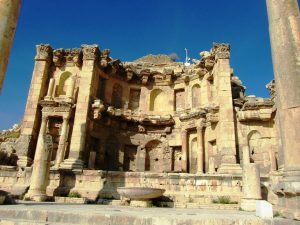 Within the site there are also two excellent museums; the Petra Archaeological Museum and the Petra Nabataean Museum both of which represent finds from excavations in the Petra region and an insight into Petra`s colourful past. A 13th century shrine, built by the Mameluk Sultan Al Nasir Mohammad to commemorate the death of Aaron, the brother of Moses, can be seen on top of Mount Aaron in the Sharah range. 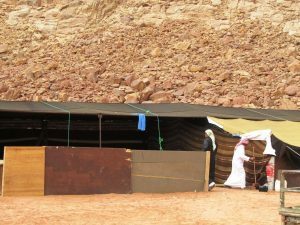 Inside the site, several artisans from the town of Wadi Musa and a nearby Bedouin settlement have set up small stalls selling local handicrafts, such as pottery and Bedouin jewellery and bottles of striated multi-coloured sands from the area. 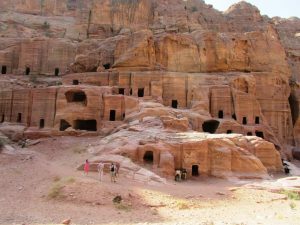 Petra was first established sometime around the 6th century BC, by the Nabataean Arabs, a nomadic tribe who settled in the area and laid the foundations of a commercial empire that extended into Syria. 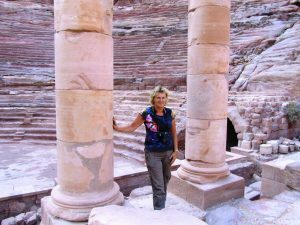 Petra the world wonder is without doubt Jordan`s most valuable treasure and greatest tourist attraction. 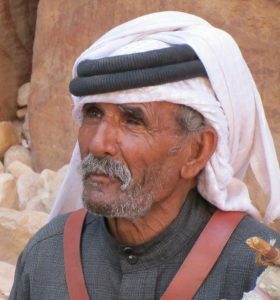 It is a vast, unique city, carved into the sheer rock face by the Nabataeans, an industrious Arab people who settled here more than 2000 years ago, turning it into an important junction for the silk, spice and other trade routes that linked China, India and Southern Arabia with Egypt, Syria, Greece and Rome. Entrance to the city is through the Siq, a narrow gorge, over 1 kilometre in length, which is flanked on either side by soaring, 80 metre high cliffs. Just walking through the Siq is an experience in itself. The colours and formations of the rocks are dazzling. As you reach the end of the Siq you will catch your first glimpse of Al-Khazneh (Treasury). This is an awe-inspiring experience. A massive facade, 30m wide and 43m high, carved out of the sheer, dusky pink, rock-face and dwarfing everything around it. 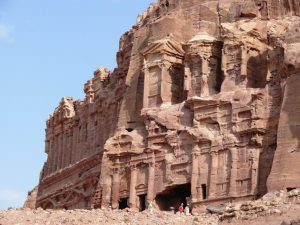 It was carved in the early 1st century as the tomb of an important Nabataean king and represents the engineering genius of these ancient people. 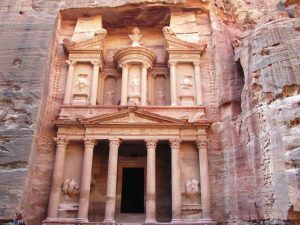 The Treasury is just the first of the many wonders that make up Petra. You will need at least four or five days to really explore everything here. As you enter the Petra valley you will be overwhelmed by the natural beauty of this place and its outstanding architectural achievements. There are hundreds of elaborate rock-cut tombs with intricate carvings – unlike the houses, which were destroyed mostly by earthquakes, the tombs were carved to last throughout the afterlife and 500 have survived, empty but bewitching as you file past their dark openings. 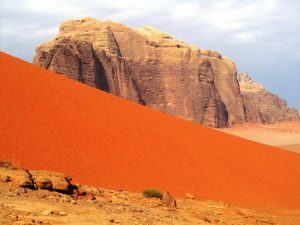 The giant red mountains and vast mausoleums of a departed race have nothing in common with modern civilization, and ask nothing of it except to be appreciated at their true value – as one of the greatest wonders ever wrought by Nature and Man. Although much has been written about Petra, nothing really prepares you for this amazing place. It has to be seen, to be believed. A Roman-style theatre, which could seat 3,000 people. 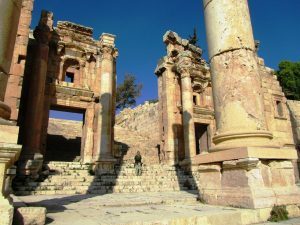 There are obelisks, temples, sacrificial altars and colonnaded streets, and high above, overlooking the valley, is the impressive Ad-Deir Monastery – a flight of 800 rock cut steps takes you there. After we spent a few days in Petra, we left for the lowest point on Earth. We drove deep into the Jordan Valley to the Dead Sea. After going close to the lake, we found a spot that showed 443 meters below sea level. 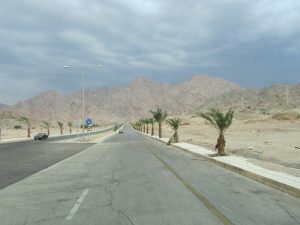 The road from Petra to the Dead Sea must be seen to be believed, despite being hazy due to the heat, it was spectacular. 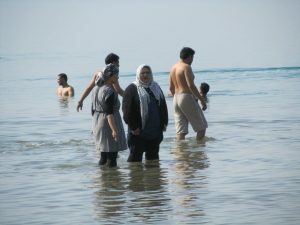 Unfortunately, despite being some of the friendliest people on earth the Arabs appear to have no idea about the environment. Just like in Sudan and Saudi Arabia, here in Jordan everything gets thrown onto the street and no-one cares about rubbish. Same at the Dead Sea, the area where we are at the moment looks like a rubbish dump. The beach is full of plastic, glass and cigarette butts. We even saw baby`s nappies floating in the water. I hear that the King of Jordan is a devoted diver and wants to protect the reefs around Jordan and in the Red Sea. 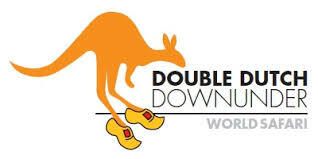 I think he should get Aussie Ian Kernon involved and organize a Cleanup Arabia Day. 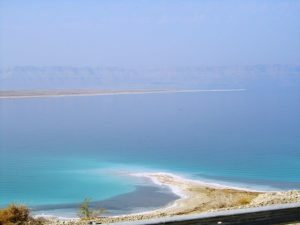 The Dead Sea is one of the most spectacular natural and spiritual landscapes in the whole world. It is the lowest body of water on earth, the lowest surface point on earth, and the world`s richest source of natural salts, hiding wonderful treasures that accumulated throughout thousands of years. Where rocks meet its lapping edges, they become snow-like, covered with a thick, gleaming white deposit that gives the area a strange and surreal sense. 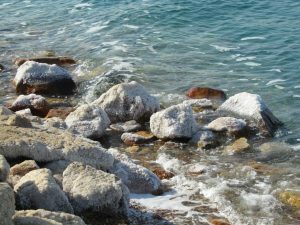 As its name evokes, the Dead Sea is devoid of life due to an extremely high content of salts and minerals, which gives its waters the renowned curative powers, therapeutic qualities, and its buoyancy. 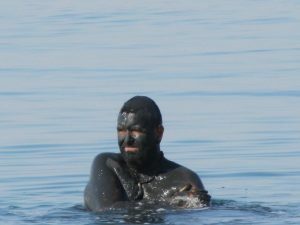 And because the salt content is up to 20 times that of most the world`s oceans, you can float in the Dead Sea without effort, which makes swimming here a truly unique experience not to be missed. This is the only place in the world where you can recline on the water to read a newspaper! Without doubt, the world`s most amazing place, the Jordan Rift Valley is a dramatic, beautiful landscape, which, at the Dead Sea, is over 400 metres (1,312 ft.) below sea level. 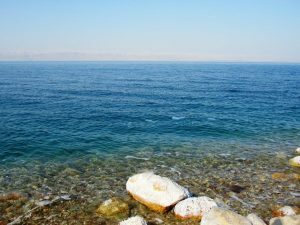 The lowest point on the face of the earth, this vast, stretch of water receives a number of incoming rivers, including the River Jordan. Once the waters reach the Dead Sea they are land-locked and have nowhere to go, so they evaporate, leaving behind a dense, rich, cocktail of salts and minerals that supply industry, agriculture and medicine with some of its finest products. The Dead Sea is flanked by mountains to the east and the rolling hills of Jerusalem to the west, giving it an almost other-worldly beauty. 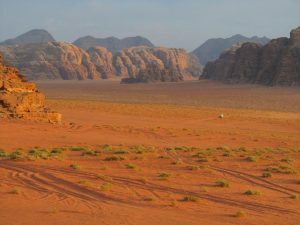 Although sparsely populated and serenely quiet now, the area is believed to have been home to five Biblical cities: Sodom, Gomorrah, Adman, Zebouin and Zoar. 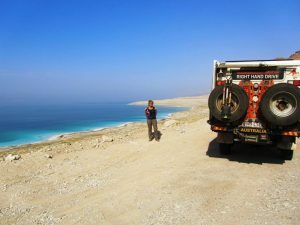 Having driven around a little we found the car park of the Dead Sea Marriot Hotel and we parked in the Day Parking area! We wanted to go for a swim but as we were not guests this was not possible without paying 35 Jordan dinar (52 AUD or 35 Euro per person). As it was already 3pm we decided to give the swim this a miss and we parked in the car park. We also walked around the Movenpick Hotel, which had a similar deal of 40 Jordan dinar, but this was 20 Jordan Dinar for swimming and 20 Jordan Dinar for food or drink. We went for happy hour to the bar (50% off) and enjoyed the view of the sun setting over the Dead Sea. 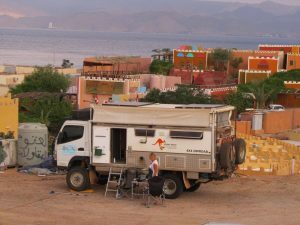 When we returned we had a BBQ in the Hotel Carpark in front of our truck. (Who would ever have thought this to be possible?). Like everywhere else in Africa and the Middle East so far, the people are its assets. They are all so helpful and so friendly. Because we haven`t had a shower for the last four days, we are going to fork out the money tomorrow to have a nice day around the Hotel pool and have lunch. We were told of a newly opened Beach Club named ‘O Beach’ that has been built according to a European concept. Well we needed some pampering after 1 year in Africa so why not, we thought. Entry fee $75.00. Feeling extravagant we said what the hell, we owe it to ourselves. Once inside it was all first class. Large daybeds, 3 large swimming pools, good music of the type we are accustomed to, three restaurants, swim up bars, spa, shops open-air cooling systems for the hot months – today at 35 degrees Celsius it is classified as winter. And best of all, there is no rubbish lying around. We also had our first dip into the Dead Sea. What an experience because of the salt, you do float on top of the water. The rest of the day we lazed in the sun, had a few drinks and a great lunch. The place opens at 9am and closes at 5am. After 9.30pm, it converts into a large open-air nightclub with live entertainment. We tried to stay the night in the car park, but this was not allowed, so we moved to the Public Beach area just up the road and settled in the car park overlooking the beach. We are looking forward to another day at the Dead Sea tomorrow. We are realizing that this could be our last swim in warm waters. Other Europeans told us that in Turkey it is already snowing, and the South Coast area of Turkey is only around 20 degrees. Our next stop is Amman only 70km away. On a low note we should mention that there is a real problem with rubbish lying around everywhere and nobody seems to care. Last night we could see the lights of Israel and Jerusalem in the distance and it was also then that we realised that we had not seen any traffic on the Dead Sea. It appears the border between Israel and Jordan is only 3km from the beach. This morning we witnessed a beautiful sunrise with the white mountains of Israel on the other side of the Dead Sea. Today we also saw council people in a car spraying DDT to kill the flies. This is the first time I have seen this since I was a kid and in most countries, it is banned. This was carried out by the local council and I would think getting rid of the garbage would have been a better approach to fix the fly problem. As it is less than 1-hour drive to Amman, we decided to stay the day here at the Public Beach. Friday and Saturday is the weekend and we hope that tomorrow, Sunday, we will be able to get our truck serviced (oil, grease and filter changed.) Late in the afternoon we left the Dead Sea and climbed the 1500 meters to Amman in around 80km. 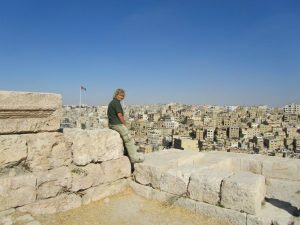 By now we are well on the traveller’s trail and we have been told of a German mission in Amman where we can camp. It was also suggested as being a good place to service the truck. 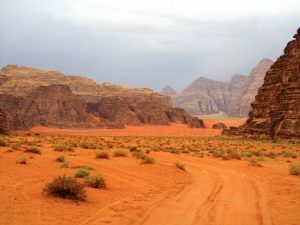 By the way, we have enjoyed Jordan and its western lifestyle, and all the conveniences associated with it. After the first cool night since Addis Abeba, I had no problem with getting out of bed because our friend the Imam woke us up at 4am as usual. Clary became ill last night and organized herself a bed in the Mission where we were staying. At 10.30 the vehicle service was done at a cost of 68AUD (foreigners price), but still a lot cheaper than the Mitsubishi dealer. 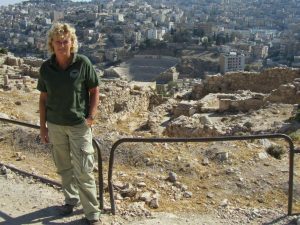 The campsite where we are staying is located on the outskirts of a Palestinian Refugee Camp in the Eastern Part of Amman. The place we could park is called Theodor Schneller Schule. Its motto is to offer children a perspective and to educate them not only with the correct principles, but also with tolerance. Website www.evs-online.org On Monday Clary felt well again and I felt okay but a little weary. However, I was not sick enough to stay another day with the truck. We wanted to see Amman. 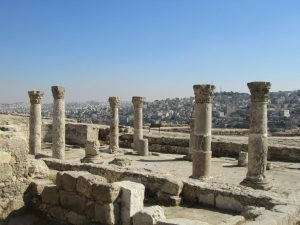 Amman, the capital of Jordan, is a fascinating city of contrasts – a unique blend of old and new, ideally situated on a hilly area between the desert and the fertile Jordan Valley, a real change after Sudan and Ethiopia. In the commercial heart of the city, ultra-modern buildings, hotels, smart restaurants, art galleries and boutiques rub shoulders comfortably with traditional coffee shops and tiny artisan’s workshops. Everywhere there is evidence of the city`s much older past. The one thing we really noticed was the change (drop) in temperature. The downtown area is much older and more traditional with smaller businesses producing and selling everything from fabulous jewellery, to everyday household items. The people of Amman are extremely hospitable. They welcome visitors and take pride in showing people around their fascinating and vibrant city. 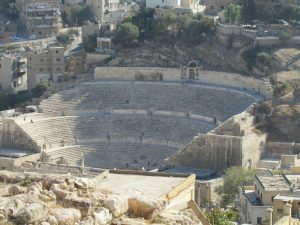 Our Taxi driver did all the commentary while we visited the City`s Citadel and the Roman Theatre. In the afternoon when we did our grocery shopping, he insisted in helping us. Unbelievable. The city`s Citadel is one of the highest points in the city and the views are typical Middle East. This area goes back to 2000 years before Christ. Sites we visited were the remains of the ancient citadel, the adjoining archaeological museum, and a large, finely preserved Roman amphitheatre, which once seated 6,000. Amman city has is the major influx of Palestinian Refugees. Around 500,000 arrived during the 1990/91 Iraqi Invasion of Kuwait. Traffic is very chaotic to be polite and no-one seems to care about traffic rules (2 lanes become 5). Like all other Arabic countries, we have visited so far, the place is full of plastic and rubbish that just gets thrown out of the cars without any care for the environment. An early rise to try and beat the peak hour in Amman. It was cold, very cold when we woke up. 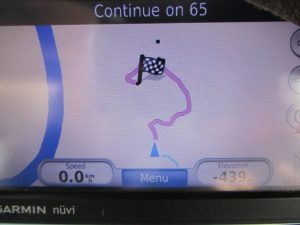 We left our campsite at 6.45am but it only took 10 minutes before we came to a halt in chaotic traffic. One hour later we had traveled the 13km to get out of town and were on our way to Jerash. 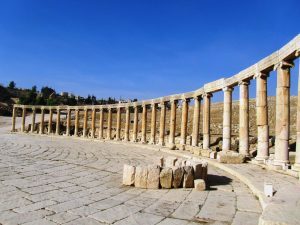 A close second to Petra on the list of favourite destinations in Jordan, the ancient city of Jerash boasts an unbroken chain of human occupation dating back more than 6,500 years. Conquered by General Pompey in 63 BC, it came under Roman rule and was one of the ten great Roman cities. 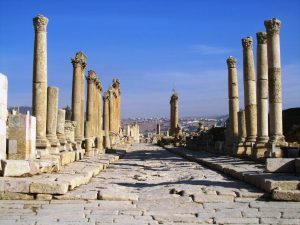 Jerash is now generally acknowledged to be one of the best preserved Roman provincial towns in the world. Hidden for centuries in sand before being excavated and restored over the past 70 years, Jerash reveals a fine example of the grand, formal provincial Roman urbanism that is found throughout the Middle East comprising paved and colonnaded streets, soaring hilltop temples, handsome theatres, spacious public squares and plazas, baths, fountains and city walls pierced by towers and gates. 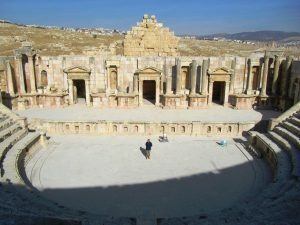 Beneath its external Graeco – Roman veneer, Jerash also preserves a subtle blend of East and West. 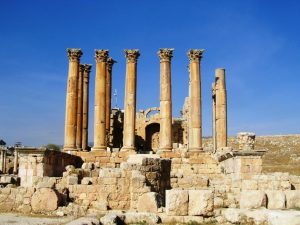 Its architecture, religion and languages, reflect a process by which two powerful cultures meshed and coexisted, The Graeco – Roman world of the Mediterranean basin and the traditions of the Arab Orient. 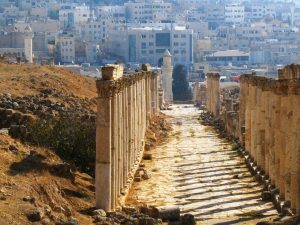 The modern city of Jerash can be found to the east of the ruins, while the old and new share a city wall. Very impressive and a lot less tourists than we had seen in Petra and Wadi Rum. Forty kilometers to the Syrian border from here.